S100 Polishing Soap creates a mirror finish on chrome and metals! Cleans and polishes metals without abrasives. Removes rust, tarnish and stains from chrome, stainless steel and aluminum. S100 Polishing Soap for motorcycles is a totally unique way to clean and polish metals. It works like a stellar metal polish but it's as easy and safe to use as a soap. S100 Polishing Soap removes rust, tarnish, and stains like a metal polish, but it's easier to use. Because there are no abrasives, there is no chance of scratching metal. Yet, S100 Polishing Soap is capable of producing a mirror shine! There's nothing in S100 Polishing Soap to harm your motorcycle or your skin. 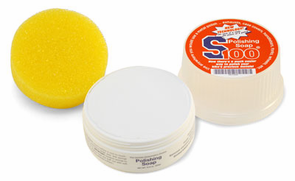 Use the included foam sponge to create a soapy lather with S100 Polishing Soap. Then scrub down a section of the motorcycle and rinse well with water. Metals will be clean and brilliant. Use S100 Polishing Soap to keep your motorcycle gleaming. I use this product for everything from the chrome on my Harley to my wife's silverware... it is the easiest method I have found to quickly and safely clean chrome!